Odyssey FZG412LW Guitar Amp Head Case w/ Wheels DJParts - All Variety of Parts that DJ Needs. 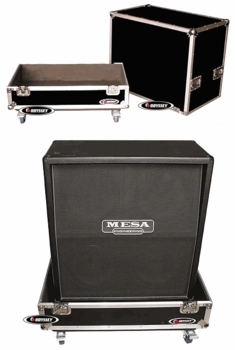 Get your act together with our super large 4 x 12 ATA Guitar Cabinet case, great for those giant Mesa Boogie and Marshall models. Features heavy duty construction and super smooth wheels with brakes. Fits cabinets or combo amps up to 34" x 33.5" x 20.25". Foam inserts allow you to customize the fit for most combos/cabinets. Total inside height is 33.5"